This title was first published in 2001. 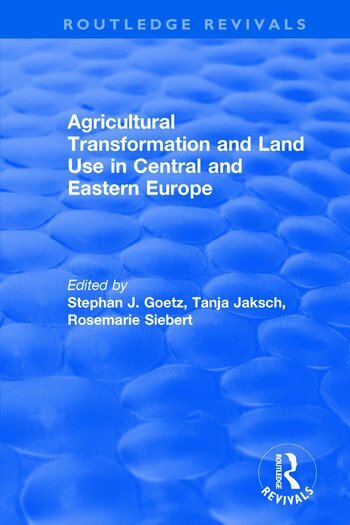 By presenting research from a multi disciplinary perspective, this book will serve as an important reference tool for researchers and others interested in the land use issues of Central and Eastern Europe as well as agribusiness leaders seeking potential trading relations with and within these European countries. Contents: Central and Eastern Europe agricultural transformation in a global perspective, Stephan J. Goetz; Climate, soils and agricultural potential, Gudrun Loose; Social change and trends in rural areas, Rosemarie Siebert; Estonia, Elke Knappe; Latvia, Elke Knappe; Lithuania, Elke Knappe; Belarus, Dieter DrÃ¤ger; Russia, Tanya Jaksch and Dieter DrÃ¤ger; Ukraine, Hermann Mertens. Eastern European Countries: Bulgaria, Dieter DrÃ¤ger and Tanja Jaksch; The Czech Republic, Tanja Jaksch; Hungary, Tanja Jaksch; Poland, Hermann Mertens; Romania, Dieter DrÃ¤ger and Tanya Jaksch; Slovakia, Tanya Jaksch; Land use for forestry, Albrecht Bemmann; Prospects for the future, Tanya Jaksch, Rosemarie Siebert and Stephan J. Goetz; Index.